No matter the size of your shop, material and inventory storage is a challenge. We offer the answer with a large selection of customizable material handling and inventory systems. Material storage is an integral part of operational efficiency. Time is easily wasted when employees have to rummage around trying to find the materials they need to complete their assigned task. Our material handling solutions offer you versatility in keeping the necessary products as close as possible to the work space in which they are needed. Inventory storage systems keep your finished product in an orderly and clean manner, ready to be packaged and shipped. Inventory not stored properly can become damaged or dirty. If it is delivered in such a condition, you are certain to disappoint you customers. Keep your customers happy by keeping your inventory stored in one of our unique and customizable storage solutions. Storage, drying rack, wheeled 6'W x 6'6"H. 10 shelf 18".. 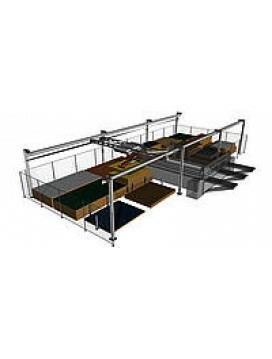 Unique and automated, Barbaric material handling systems are space-saving, profit increasing machines that improve the overall impact of your bottom line. Powered by vacuum suction technology, the material handling machines cradle your materials prev..